AFTER having served for nearly twenty years as the Member for North Sydney and 17 years on the frontbench, I advised the Prime Minister that I did not wish to continue as a minister in the Government and that it is my intention to resign from the House of Representatives. It has been a great honour to serve my local community as the second longest serving Member for North Sydney since Federation. I have no desire to break Billy Hughes’ record! MY Annual Bike Program has been a personal highlight for me. Towards the end of each year, I ask the local schools in North Sydney to nominate students who deserve acknowledgment for their hard work and achievement during the year. It is always impressive to learn of the achievements of outstanding young students who deserve recognition for their incredible strength of character, improvement in the classroom, dedication to their studies, or who have shown great character to overcome adversity. In recognition of their efforts, I present the students with a new bike, along with a certificate of achievement at a private ceremony attended by the Principal and a parent or guardian. FOR over a decade, I co-ordinated the North Sydney Community Awards to recognise organisations and individuals who make an outstanding contribution to our community. The Awards aim to encourage greater community involvement and remind locals who volunteer, usually without expecting recognition, how valued they are. In the past few years I have presented around 100 awards each year to people who are nominated for special recognition by members of the community. Past North Sydney Community Award recipients have included sports people, young and older members of the community, community groups; Citizen of the Year and Hall of Fame Member. Over the years members of the Australian Defence Force have also been recognised, as well as local students in their final year of school recognising outstanding achievement. The awards ceremony has attracted many special guest speakers over the years, often members of our community who have also contributed throughout their lives and careers to volunteering and working for their community including Stuart Wagstaff and Lisa Wilkinson. FOR many years, I have received hundreds of entries from primary school students across the electorate for my annual Christmas Card Competition. Students are invited to submit a drawing or painting to the competition following a theme for the year. Themes have included Peace, Family, What Christmas Means to Me and Friendship. The winning entry becomes my Christmas card that year, which is distributed widely within the electorate, nationally as well as to my friends and colleagues around the world. GROWING up on the north shore of Sydney, a large part of my childhood and teenage years were spent following the mixed fortunes of the North Sydney Bears. I fondly remember the days spent at North Sydney Oval under one of its famous fig trees cheering on the Bears. I spoke in Parliament in 2010 advocating the return of the Bears to the NRL, albeit in their current form as the Central Coast Bears. They remain an important part of the psyche of league on the north shore and it is this reason that I am proud to be a foundation member of the Central Coast Bears. AS I said in my 2015 Budget speech, our future growth will come from growing small business into big business. From July 1 this year, small companies with annual turnover of less than $2 million had their tax rate lowered, from 30 per cent to 28.5 per cent. As most small businesses are not run as companies, we are also giving an annual 5 per cent tax discount of up to $1,000 a year for unincorporated businesses. We recognise that small business needs better cash flow and better tools for innovation as well. So, from Budget night 2015, small businesses can claim an immediate tax. To the community in the North Sydney electorate – thank you for giving me the opportunity to serve you. 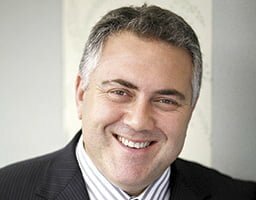 JOE HOCKEY was the Treasurer of Australia in the Abbott Government and long time North Sydney MP.